There are a few things in pop music that really annoy me. First is the lyric “Yeah, yeah, yeah!” – Which is just lazy gap-filling. This is why we are listening to you sing the song – To get your artistic representation of events! Thirdly is pronunciation, or is that “pronounciation”? Slurred, or mispronounced lyrics have ruined plenty of good songs. Take UB40’s cover of the Elvis classic: “I Can’t Help Falling in Love With You”. “Wise man say only fools love sheep. Speaking of “You”, this one word has to be one of the most fuddled pronouns around. “Dew” and “Jew” are only a two of the most common “Eww” sounding “you” replacements. This weekend just gone, however, I heard a new flubulation: “Shoe”! It got me thinking, and singing to myself. So much so that I managed to write a few verses of a pretty decent song! Like the toe piece torn out of a jandal. It’s Bob Marley singing without his Wailers. A Hipster not adorned in worn Chuck Taylors. What did that comic say? I’m no longer “good as new”. My sole is worn right through. This picture represents everything I love and admire and fear simultaneously in one image. Our little Miss Napier in Frame isn’t so little any more. From the emotional trials and tribulations of IVF, to (SPOILER ALERT!) conception and a surprise home birth, to nappies and smiles and giggles. Crawling, talking and walking. It may only be five years, but it feels like a lifetime! Our little baby, who would only ever fall asleep snuggling in my arms is now a smart & sociable girl riding her bike freely (she demanded we take her training wheels off one Saturday afternoon, immediately started riding perfectly without them and never looked back). She has truly begun making her own way in the world. Having learned so much by the age of five in Kindy (she can write her name and numbers, count beyond 100 and speak bits of Spanish and Te Reo – I can’t remember being able to do that at 6!) part of me is convinced that she just becomes an adult now, right? It’s off to school in the next few weeks & into the big, wide, world. Peer pressure, bullying, body image and boys – All things I can’t always defend her from await, though hopefully in the far-off future for now, at least. For me Tamatea Primary was the scene and catalyst of some of my most cherished memories. That’s 10-11 year old me, middle row, second from the left. An 80s childhood at its best. I hope her primary school years bring her as much fun, knowledge and friendship as mine brought me. There are, of course, things I CAN help defend her from. I go to work each week, not for myself, but to provide a safe, warm, loving home and to ensure there is always food on the table. Growimg up sometimes a safe, happy, loving home is all you need. I was very fortunate that mine was. In primary school I remember the teacher telling us there was a hole in something called “The Ozone Layer” and expecting that within the decade we would all have to be walking around in space suits for protection. That didn’t quite come to fruition, but there are plenty of equally sized, and bigger, environmental threats out there, so I will do my best to keep the world she will inherit as clean and safe as possible. I will always be there for her. Even when she doesn’t want me. When she hurts herself, she currently runs crying to mum for cuddles. Even when she is having a screaming match with mum, she STILL runs to her for cuddles afterwards (there is a level of logic there FAR beyond my comprehension). But, possibly hardest of all, I must let her fall and fail occasionally. To watch her have hopes and dreams dashed. It’s hard, but it will make her stronger. It “builds character” (another terrible, but true, cliche). And she already has loads of that – Kindness, caring, love and compassion. All those things too many adults seem to lose as they grow older. The other day she got her bike out of the garage to ride it around the yard, so I took mine out for the first time in ages, too, and together we went for a ride along the neighborhood cyclepath. We kept a safe, respectful distance apart, riding along and chatting. Sometimes she was in the lead and sometimes I was. We both occasionally got the wobbles, but it was fun. I hope as she gets older she will want me to come along on more rides and adventures. To bring picnics and puncture repair kits. She might even need to bring them for me! These first five years have been one hell of a ride! But it’s worth it – She is amazing! One of my many creative talents, other than writing and talking is modelling – the scale variety, not the catwalk variety. Although I did do that in high school. Once. My interest in modelling started off many years ago. Like generations of kiwi children, I grew up with Toro and Lego blocks, making cars, buildings, planes, trains, space ships and all sorts of things – They were a great introduction to creativity and creation. But after going to a model show at a local school with my Dad in the 80’s and seeing the dioramas and detail that went into scale models, I was hooked! Dad had been a bit of a modeller himself in his younger days. But rather than planes or trains, Dad made buildings. He was so good he made it into Napier’s Daily Telegraph with a model of the city’s new St John’s Cathedral. He was even offered a job with the Ministry of Works in Wellington making scale models of proposed buildings, bridges and structures, but turned it down. The first two kits we ever got and made together were a WWII Mk 1 Spitfire and a Cold War Mig-27 Flogger jet fighter. We put them together in the garage, glued them and even painted the Spitfire. It was a wonderful bonding experience and a cherished memory. I started making more and more models. The closest model shop to our house was also a bike shop, so ever since those days a part of me has associated model kits with the smell of rubber (and glue and paint..). I even won a prize for the Skyhawk diorama I made in a local toy shop’s modelling competition. The prize? Another model kit! It was around this time that Japanese model giants, Tamiya were really taking off in New Zealand, especially with their radio controlled cars (the “Lunchbox”, “Bigwig” and “Hotshot” are still my all-time favourites) and 1/35 scale model tanks and soldiers. These military models became a real interest of mine (what would modelling today be without the rather magnificent engineering and design that was so unfortunately dedicated to the death and destruction of war?) because the size of these 1/35 scale models leant themselves very well to becoming the basis for highly detailed dioramas – little scenes of frozen time, usually in the heat of battle, or sometimes candid moments of rest from the fray. The (often immense) level of detail involved in making scale model dioramas led nicely into another branch of modelling – TRAINS! A shot of Mike Danneman’s exquisite N scale Colorado layout. In the 90’s I discovered model trains through a cousin who collected HO scale steam locomotives. In 1992 I found a Model Railroader magazine at the bookshop a couple doors down from the bike shop / model dealer and was henceforth hooked on that too! Whole basement, nay, HOUSE-SIZED train layouts! Model diesel locomotives towing dozens of ore car hoppers and log cars! Railroads weaving over, around and through Colorado mountain ranges, valleys and rivers, shrunken down and represented in miniature, exquisite detail in the space of a six foot by six foot corner layout! There was only one problem – Model railroading is rather (read “VERY”) expensive, so my tiny train ventures have largely been much smaller and slower, as time and finances permitted, than with the planes and tanks. I branched out even more, diversifying into making model cars and trucks. When I started working for a forestry company I built a model logging truck! Like many modellers family takes over for a while and while the production line slows or ceases, the kitset collection continues to grow exponentially. For me that was when our daughter came along and we bought our first home – What little free time I had evaporated for a while. When I did have time to model I started putting a lot more work, concentration and detail into the models I made. They became specialised projects, like the Valentine tank I built to honour my Dad driving them during his Compulsory Military Training service. This is a 1/48 scale Valentine tank I built earlier this year. My Dad drove them as part of his Compulsory Military Training in the 1950’s, so I built it to honour his memory and service. As our daughter got older it gave me more time to go back into this more detailed modelling. But before long the pitter-patter of little feet followed me out to the shed to see what I was doing and ask if she could help. I think I’d like to give up adulting for a while. Turn on the TV, radio, read the newspapers or surf online and you’ll struggle to avoid prime time examples of racism, sexism, sectarianism, greed, stupidity and people just being general dicks to each other. Even the presenters themselves – Positions that used to be the bastion of straight-forward news and current affairs delivery are not immune from this. I can think of several who appear to be actively enabled, if not impressively incentivised to be “controversial”. And they’re given the full gamut of their employers’ television, radio, web and even good old analogue newspaper formats to say stupid and mean things just to attract attention, clicks and “Likes”. I’m pretty certain Dougal Stevenson and Philip Sherry would thump you if you told them to act like that back in their heyday. Don’t make Phillip Sherry angry. You wouldn’t like him when he’s angry..
I’d say it’s childish, but I feel that would be a grave insult to children everywhere. My own daughter, for example, will turn five later this year. She’s brilliant – She’s kind, caring and compassionate – All the things that so much of the world isn’t! This may or may not have something to do with the fact that we have largely kept her away from the news and traditional forms of media. 6pm – Traditional “News Time” is TV/device off time in our house, followed by playing / reading and her bed time. We usually don’t turn the TV or phones on again until after 7pm. Some might call us “Snowflakes” or say this is “Virtue Signalling”, but I prefer my daughter to grow up with empathy, rather than being a sociopath. When other adults or managers/bosses are getting me down I find picking my daughter up from Kindy to be an intellectual and spiritual lift. Just the other day her kindergarten celebrated Peruvian Independence Day (one of the teachers is from there and very proud of her home country). Children and their parents from Pakeha, Maori, Indian, French, Chinese, Japanese and many other cultures all celebrated this teacher’s homeland together. There was singing, dancing, food and fun – It was caring and inclusive – All things that life should be! This is where I hold out hope for the future, because this is normality for our children. Our children will live in a society where their friends will be all sorts of colours, sizes and shapes. Their favourite foods won’t just be the rather bland NZ cuisine I grew up with in the 80’s, but from all around the globe – An exotic range of flavours us adults are only just learning about. It won’t matter whether they have mum and dad at home, just mum or just dad, two mums, two dads, grandparents or other relatives, so long as they have a home where they are safe and loved. This will be their normal. This is something to strive towards. I think we have a lot to learn from our children. We should be taking more notice of them and less of those provocative, attention-seeking adults in the media. Look at me, all pictorial and glossy! Sorry I haven’t been writing on here as much as I used to. I would LIKE to, but work, earning a living and daily life has a nasty habit of getting in the way of creative pursuits. I have still been writing, though. In Hawke’s Bay we have a bi-monthly magazine called “Bay Buzz”. It started out life ten years ago in an online format and slowly progressed over the past decade into this quite marvellous, glossy publication. I sent the editor, Tom Belford, a piece I had written and he published it online in November 2008. It was one of my first forays into writing stuff on and for the interweb. A year or so later he asked me to write a regular piece, which we called “Man About Town” (not too thematically dissimilar to “Napier in Frame”, really) which I did for about a year, before the need for an income over-shadowed writing and my creative wordsmithing skills returned to their stasis pods, occasionally emerging to point out local wrongs and the bleeding obvious our local mainstream media somehow managed to miss with unnerving regularity via opinion columns and Letters to the Editor. Five years ago (YES, FIVE!!) I started this site and started writing more regularly again. A little over a year ago Tom, having seen my site and opinion pieces in the paper, approached me and asked if I’d be interested in writing of Bay Buzz again. I accepted and the results have been quite good and glossy, with six columns published so far (and a cameo in the upcoming 10th Anniversary edition, too). While not being paid for my regular columns because they are classed as “opinion” (how this same system doesn’t apply to certain massively monetarily and multimedialy enabled, yet utterly asinine ‘opinionist’ radio and TV presenters, I don’t know.. ), I am getting more recognition. I have been stopped in the street a number of times by people telling me they saw me in the magazine and liked my writing, which is pretty cool – I’m not used to praise! It’s also good to see a Hawke’s Bay publisher footing it with the “big city” type(face)s – A couple of people have said Bay Buzz is like, if not better than, (because of its local focus) the likes of North and South magazine (the Wellington equivalent of Auckland’s Metro – High praise indeed! I will do my best to post on here more often – I’m due back on Radio New Zealand’s “The Panel” next week and I have two other posts in the works, so material is seldom in short supply – it’s more a matter of available time. Perhaps if RNZ+, or their regional expansions were to headhunt me, I could even do it for a living!? We have some visitors in Napier this week! (TV) Three’s “The AM Show” is gracing our fair city as part of a tour they are doing with telecommunication infrastructure providers Chorus. They have already visited Queenstown and Nelson, with a final stop in Rotorua following their last show here tomorrow (Wednesday, 11 July). 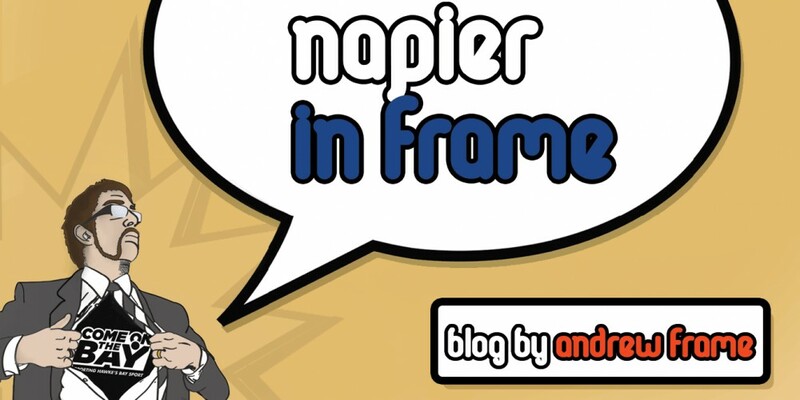 It’s been quite exciting for the city, which is usually only on the receiving end of simulcast media networks and completely ignored by some “nationwide tours”, having the show and Napier itself broadcast live to television screens around New Zealand from 6-9am each morning, as well as being simulcast on radio and across the internet. Broadcasting from outside of Auckland allows the show to feature special items, news and people unique to each region. So far in Napier they have featured an obligatory touristy Art Deco piece and mayoral interview, but also Hawke’s Bay success stories, like celebrating Flaxmere College’s educational excellence. As of their second show they had yet to touch on thornier issues like the War Memorial and the city’s water woes, or asking for ratepayers’ opinions, then ignoring them, which I still feel deserve wider attention than they have gotten (“sunlight is the best disinfectant” they say..), but promoting Napier, Hawke’s Bay and all the awesome things we do and can offer and represent is a great way of promoting the region and attracting people here (the weather has been pretty stunning while they are here, too!). I had promoted the idea of hosting such breakfast television shows in Napier, along with 30 other ideas to attract attention to the city five years ago in my “Month of Fun Days” post. I even used the post in a couple of applications for jobs promoting Napier. I never got so much as an interview for the jobs, but I have seen a number of the ideas come to fruition in recent years, which while great to see, is also a bit of salt in old wounds (I haven’t received any credit for the ideas, nor assistance in making them happen myself). Hopefully it’s just the first of many occasions where Napier and Hawke’s Bay take centre stage for all the right reasons! After 22 years I will be behind a microphone and on the radio again! I’ve been asked to be on Radio New Zealand’s “The Panel” on Wednesday 13 June as an actual panellist! After making a few cameo appearances on RNZ last year (and a little bit of lobbying on Twitter) I was asked a couple weeks ago if I wanted to be on the show – I leapt at the chance! Since then I have been doing my best to preserve my voice, which has not been easy, as winter ills have struck almost everyone around me and I have lost count of how many times I have been sneezed and coughed on or near. It’s a great opportunity – Not just for me, but for getting some more exposure for Napier and Hawke’s Bay, which I don’t think gets the level of coverage it deserves nationally. I’d like to give a big thank you to RNZ Afternoon’s Executive Producer Caitlin Cherry for the opportunity – I hope I don’t let her, or Hawkes Bay down (or swear on air..). You can replay my appearance on The Panel’s RNZ page HERE. The annual reshuffling of presenters amongst New Zealand’s broadcasters started again recently. The most notable change, being Hilary Barry taking over from the recently resigned Mike Hosking and Toni Street on what used to pass for current affairs on our “State Broadcaster” TVNZ. A few National Party spin doctors got their noses out of joint that Barry’s replacement on TVNZ’s “Breakfast” show will be former Green Party candidate (and co-host of both Crowd Goes Wild and Back Benches on Prime), Hayley Holt, but all that really came down to was sour grapes at losing their biggest primetime soapbox. But it did raise one question: Where is New Zealand’s new media talent? This has been an issue for New Zealand’s commercial broadcasting networks for years. I have previously written about how little change there has been in network radio talent in New Zealand over the last 20 years. It’s gotten to the point where almost 160, once “live and local 24 hours a day!” announcer positions across New Zealand were covered by a mere eight announcers in their network’s Auckland headquarters’ studios. A handful of long-term, nationally simulcast announcers have either recently “retired”, or been moved on from positions they have had on the airwaves for up to and over twenty years, but with such a dearth of positions for those dreaming of, or studying towards a career in radio, the waste of talent time, and investment in qualifications must be utterly disenchanting. Add to that the popularity of personalised music streaming services and I would almost go so far as to say that by drying up their own talent pool and personal, local touches, commercial radio networks in New Zealand have already gone past the point of no return – Dooming themselves to obscurity and oblivion. But are their television affiliates heading down the same path? A recent NZME article opines, in light of the Breakfast / Seven Sharp hosting announcements that TVNZ’s selection of hosts is a bit.. “monochromatic” – That is a mainly Pakeha pool of talent, with a penchant for blonde females. (The article doesn’t mention that at least two of these same blondes featured in the photo for the link to the article also host shows for NZME’s own simulcast radio network “The Hits”). Hair colour aside there does appear to be a significant stagnation and evaporation effecting New Zealand television’s talent pool. While Barry and Holt are in new roles, they are not new to our TV screens. Before moving to TVNZ Barry was, of course, a cornerstone of Mediaworks’ Three News before the TV network’s management seemingly tried to scuttle their own ship. Most other hosting roles for “new” shows (we’ll get to that in a minute) on our screens are merely filled by long-term staff from other sectors of Mediaworks’ TV and radio empire, or TVNZ’s television and NZME’s radio networks being shuffled around. The “newest” hosting talent that immediately comes to mind is Mediaworks’ Kanoa Lloyd and TVNZ’s Sam Wallace, both of whom started out on TV3’s Sticky TV, before moving to weather hosting/reporting roles and beyond on the rival networks. Both Lloyd and Wallace have now been in the industry for 9-14 years respectively, making them almost battle-hardened veterans by modern media standards. But it isn’t just the hosting talent that is getting long in the tooth – The shows they are hosting are becoming less and less “fresh” and original. When TV3 rebranded themselves as #HashtagLoLSelfie, sorry “+hr=e” early last year it gave a bit of insight of what goes on (or rather what doesn’t) inside the minds of those who pick what we can watch on New Zealand’s commercial television networks. MediaWorks’ chief content officer Andrew Szusterman. Here’s humour and irony in Szusterman using 7 Days as an example, and not just because it’s a comedy show, but because the show is based, amongst other things, on similarly formatted “Mock the Week” (first screened in the UK in 2005, while the TV3 brand was still “fresh” and “new”), but 7 Days’ core cast of comedians had been regularly appearing on the very same channel – TV3 – since 1996 on a show called “Pulp Comedy”. That’s the same talent, largely unchanged, on the same channel for 21 years! While the world may have moved on, programmers and content officers’ sights have clearly not. The most recent series finale of “The Block NZ” (the sixth since starting in 2012) ended in confusion, derision and claims that it might be signalling the end of the Auckland real estate boom, or it might just have been a signal that New Zealand viewers were tiring of play-acting dressing up as wall-to-wall renovation “Reality TV” shows. After all, the original “The Block” had first aired on Australian television 14 years before in 2003. “The Bachelor”, another of TV3’s “reality TV’ stable staples first screened in America in 2002, so it’s roses were likely getting a bit dried up and losing most of their petals and appeal. Not wanting to be left out, TVNZ last year premiered the NZ incarnation of the Granddaddy of them all, “Survivor”, which started in America in 1997 . The world has indeed moved on, but those at the helm of New Zealand’s TV and radio networks have clearly not! Rather than try to change and innovate, like their now far more successful streaming competitors, managers of New Zealand’s broadcast media merely shake their fist and yell at the clouds, or, like dinosaurs, just stare at the glow in the sky as the asteroid hurtles towards them. Will 2018 be the year they finally become extinct? Kermit the Frog once sang “It’s Not Easy Being Green”. Over recent years it’s also not been easy being regional New Zealand after almost a decade of neglect and lack of economic development from central government. Just like in New Zealand’s media, main centres, especially Auckland, ruled supreme and sucked up all the infrastructure, attention and economic prosperity, whilst regional centres just didn’t matter. What a pathetic cop-out by the person supposedly tasked with looking after the whole country’s prosperity and economy! Fortunately, (depending on your political stripes) we have just had a change in government and the incoming Labour / New Zealand First / Greens coalition campaigned on platforms of regional development. Hopefully places like Hawke’s Bay will soon start to see the benefits of such policy. Because, over recent years, Hawke’s Bay has been all too easily forgotten. Imagine a Mission Concert headlined by New Zealand’s latest great songstress! She was barely even scratching the surface of potential venues and destinations – more “whistle-stop” than nation-wide tour. As you may have perceived, I have developed a growing lack of faith in New Zealand’s simulcast network media. This was only deepened a year or so ago, when one such network held a “Provincial Pick Up” promotion. Starting in Invercargill and taking the “path less travelled”, by visiting regional centres like Timaru, Ashburton and Blenheim it started reasonably well. But having crossed Cook Strait and stopped in one of Wellington’s biggest suburban areas of Porirua, its next stop was… Taupo. Not Levin, not Palmerston North, and CERTAINLY NOT Hawke’s Bay where, you would think bigger population bases would have provided more coverage, attention and contestants. To rub salt into the wound the “map” that accompanied the competition’s page featured a rather clear indication that the Provincial Pick Up would be heading to New Plymouth, when this wasn’t the case. As part of its final leg, the tour would make at least four stops in (as far as you can get from provincial New Zealand)” Auckland. We Even Get Left Out of Memes! During a recent winter cold-snap the entire country shivered through some very bracing temperatures. In true wise-cracking kiwi fashion someone made up an alternative weather map of New Zealand to illustrate just how cold we all were. The majority of regions labelled “Cold AF” (or “Cold as F***” for those who took English class Pre-2010). Now, we are known for enjoying a far more temperate climate than the rest of New Zealand in Hawke’s Bay, but I was here during that time and I can confirm to being one VERY “Cold AF” (the far more “G” rated, name-related acronym, that is) during that time! Hawke’s Bay – A Technological, Astronomical Region! Many may have perceived “Regional Development” as “Rural Development” – focusing on farming and other primary industries. This is not necessarily the case. The combined population of Napier and Hastings is around 130,500 – making us the 5th largest population base in New Zealand (Hamilton = 150,000 Tauranga = 128,200) – far from the sort of small, rural town that gets ignored more often than not. “A country made progress despite of its politicians”. A prime example of this has been the creation of a “Tech Hub”, with anchor tenants Now and Xero opening in Napier’s seaside suburb of Ahuriri. But the fact Hawke’s Bay has still been able to make these technical and economic advances as a region is still great to hear. And how many other New Zealand cities or regions have their own rocket launch facility? So slap that old John Hughes classic in the VCR, crank some Simple Minds on the stereo and pump that fist in the air. Because this region has just started going from strength to strength, so Don’t You Forget About HB! Earlier this month I was surrounded by smiles. Adults and children alike beamed, stared, gazed in wonder, uttering various “Ooh”s, “Ah”s and “Cool”s! I was at the inaugural Hawke’s Bay Brick Show at Taradale High School. It was an automotive workshop and it took me back to when I was about ten and my dad took me to a scale model truck show at St Patrick’s School in the 80’s. Along with exquisitely made logging trucks, dump trucks and other big rigs, I will always remember one diorama of a garage which, while it didn’t have any vehicles in it, did have engines, parts, jacks, lifts and tools all laying about the workshop as if the scale-sized mechanics had just left for morning tea and were about to return at any moment. It was one of the things that set me on a life-long love of models and how deeper levels of detail can make all the difference. Walking around the Brick Show I saw that same look on faces young and old that I had seeing that model workshop all those years ago – Intrigue, wonder and inspiration. I think it even wore off on our daughter who talked about Lego for several weeks afterwards. The next step is for us to make a scale model plane together – She’s very keen and I’m delighted of share one of my hobby loves with one of my biggest human loves.